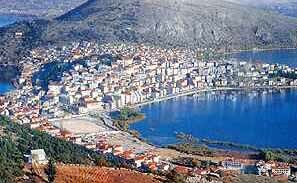 Kastoria, Macedonia, Makedonia, Travel in Greece. The city of Kastoria is amphitheatrically built on the peninsula going far into the lake, reflecting itself into the waters like a precious gem, thus creating a picture whose beauty and grandeur fascinates both Greek and foreign visitors. This traditional West Macedonian city of long history, has irresistible charms and beauty. Christos Zalokostas has once said "A few more days in Kastoria and I would never leave the city again". The city extends between Vitsi and Grammos, on a small peninsula penetrating Orestiada lake. One can reach Kastoria following many routes: Athens - Larissa Kozani Kastoria or Athens Meteors Grevena - Kastoria or Salonika Edessa - Kastoria or Salonika Veria - Kastoria. Also Salonika Prespes - Kastoria or through tire former Yugoslavia borders (Niki) Florina - Kastoria, lgoumenitsa Ioannina - Neapoli - Kastoria. All these itineraries offer to the traveler unforgettable impressions of landscapes, lakes, rivers, mountains, forests and picturesque settlements. If on the other hand you love adventure and do not get easily tired, you can travel by train up to Amintaio and then by car to Kozani and Kastoria. Finally, if you are fascinated by air traveling and prefer short cuts, there is a way for you: You can fly to Kastoria with "short" aircrafts. Whatever you choose to reach Kastoria, you will experience a thrill by the beauty that is laid before you even from the first glance! The houses are built on both sides of the unrippled mountain and welcome you in a city with strong traditional color, a city which is determined to keep this color and never surrender to modern architectural trends. Facing the area from far, we have the illusion of being at the seaside, even though the attitude is 650 meters. 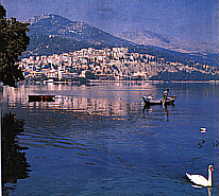 Lake: It is time now to talk about the priceless beauty of Kastoria. How about a walk, at sunset, through the streets which run around the lake, among the planes, willows and weeping willows? While the sunbeams paint with red and golden the waters of the lake, the white swans and the ducks that accompany the fishermen will draw your attention. At the same time the "boats" of Kastoria will move slowly on the waters, making you believe that this is a painting coming back to life. You can enjoy the beautiful view sitting on a stone bench by the seashore or in the fishermen kiosk built with extreme care by the members of the "Friends of Environment Association, in their effort to protect the traditional treasure of the city. While you are in the lake, you have to visit the monastery of Panagia Mavriotissa. You will rest under the gigantic old plane trees, you will visit the church of Panagia, the katholiko of the monastery and the chapel of Agios loannis Theologos with the beautiful frescoes, dated back to the II th century. If you ask for more information about the history of the monastery, father Gavriil will be pleased to answer all your questions. A walk to the Profiti Ilia, will give you the opportunity to enjoy the panoramic view of the city and since you are here, do not hesitate to climb to the shelter of Ai Thanasi, which lays on a 888 meters altitude. You will be fascinated by the view and the beauty God has so generously given to this place.